Deep in the Sahara Desert, the Al Jawf oasis in southeastern Libya is pictured in this space wallpaper from Japan’s ALOS satellite. Deep in the Sahara Desert, the Al Jawf oasis in southeastern Libya is pictured in this space wallpaper from Japan’s ALOS satellite. 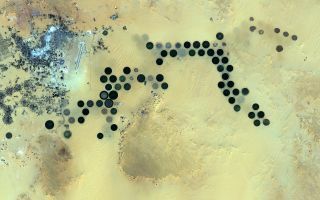 The city can be seen in the upper left corner, while large, irrigated agricultural plots appear like Braille across the image. Between the city and the plots we can see the two parallel runways of the Kufra Airport. The agricultural plots reach up to a kilometer in diameter. Their circular shapes were created by a central-pivot irrigation system, where a long water pipe rotates around a well at the center of each plot. Since the area receives virtually no rainfall, fossil water is pumped from deep underground for irrigation. This image was released Aug. 8, 2013.